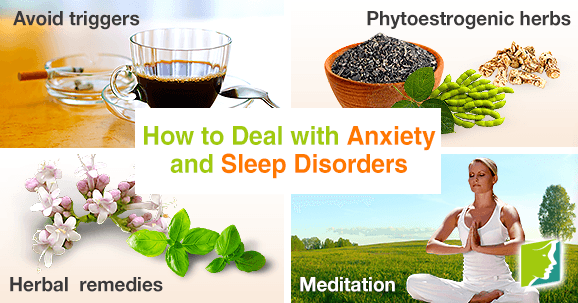 Anxiety and sleep disorders can be exhausting to have. These symptoms of menopause seem to feed into each other and create discomfort through your day and night. When you cannot relax when you go to bed at night, it can cause you to stay awake for hours, with your worries intensifying as the clock ticks. Although the symptoms can get out of hand and make you fatigued, there are always ways to recover. Find out how to stay calm and restful sleep again with these tips. While it is important to add activities to your life to help keep your stress levels in check, it is equally important to let go of habits that may be worsening your symptoms. Try to limit your intake of caffeine and alcohol, especially four to six hours before bedtime. Also, while you should be getting three hours of physical activity weekly, make sure you do not exercise two hours before bed; this can make it much harder to fall asleep. One trigger for anxiety and sleep disorders during menopause is a decline in estrogen levels, which can cause some dramatic changes in your life. For one, levels of melatonin - a neurotransmitter essential for restful sleep - will likely go down. Also, serotonin and endorphin levels can decrease causing anxiety. Several herbs have many benefits for anxiety episodes. Herbs high in plants phytoestrogens may be helpful, because they act like estrogen in the human body. Soy, flax, black cohosh, and dong quai all contain these compounds. Getting more hormone-regulating supplements is one way to treat menopausal symptoms. Studies have found that valerian may be effective for helping individuals fall asleep faster and experience deeper sleep. Also, chamomile is another soothing herb that can induce sleepiness. For general anxiety, some common remedies are kava kava and holy basil. People believe these can relax your body and mind, and help you let go of your troubles. Meditation is a good way to treat anxiety and sleep disorders. If you do not practice calming your mind, it will be much harder to cope with unsettling emotions that build up and disturb your rest. Studies show that practicing meditation can improve sleep quality and diminish stress. To get started, put on calming music, close your eyes, and breathe deeply for 15 - 20 minutes every day. Do not worry if thoughts arise - simply release them through your exhales. It may be a bit of a commitment, but your deep dreaming will assure you of its worth. Next time you are lying awake in bed buzzing with worries, remember that there are many things that you can do to improve your situation. When you are armed with healing plants, meditation, and some physical activity, you can sink into peaceful dreams more quickly and for longer.